GIANT TCX ADVANCED PRO 2 $2300.00 CAD 2018 Giant TCX Advanced Pro 2 cross bike for sale: -Giant Adv. grade carbon frame 12mm x142 and fork12mm, size SMALL -Rival 1 1x11 drive train, 40t front ring -Rival 1 hydraulic disc brakes -There are some parts that are brand NEW like, the saddle, both wheels, chain, cassette, rotors and tires. -Full specs at: https://www.giant-bicycles.com/ca/tcx-advanced-pro-2 This bike has been ridden for one month, been meticulously maintained. This TCX Adv. Pro 2 retails for $3199.00 Cad. plus sales tax, asking $2300.00 Cad. buyer pays shipping. Thanks for looking. I am selling a brand NEW Onyx Racing REAR hub ONLY. It had been build in to a wheel , BUT never been ridden. 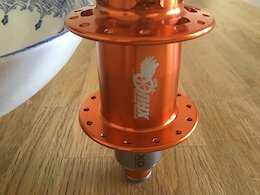 - ISO - 142mm /12mm ( this is NOT a BOOST hub ) - Anodized Orange - ## 28 Hole ## If the buyer would like the hub build into a rim ,that can be arranged too. Buyer pays for shipping. Thanks, for looking. Trico Iron Case Bike Case Very clean , In Excellent Condition Size: Outer - 47" x 30.5" x 10.5" / Inner - 46 3/4" x 30.1/4" x 10.1/4" Weight: 31lbs. (unpacked) A pull strap and wheels have been incorporated for increased mobility Three layers of foam cocoon your bicycle for maximum protection Polycarbonate Triconium shells have highest possible strength/weight ratio for external protection. Spawn Cycles 14″ Furi. 6061 T6 aluminum frame, 4130 chromoly forks, tektro v-brakes and levers, sealed bearings everywhere and 3 piece alloy cranks. Comes in at about 14 pounds – The wheel have been set up tubeless , so this bike is well under 14lbs. literally about 1/2 the weight of most bikes this size. Bike is in amazing shape, very little scratches, lots a life on both tries.